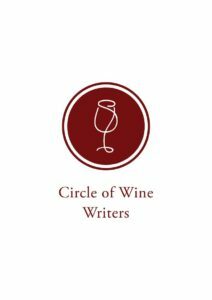 As I passed a wrought iron gate (complete with wrought iron shaped grapes and a golden “CG” adorning the top), walking on a rock covered path surrounded by vines with roses in the front, I found myself facing a remarkable building that had the shape of a bottle carved into the side of it. 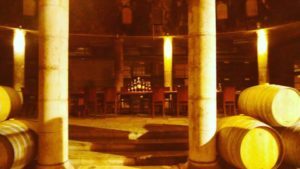 If that was not enough to draw me into an enchanted world, I then entered the cellar of this winery that had high stone pillars and an elevated area at the end of the room with glowing bottles lined up on an inviting table. Where is this magical world I found myself in, you might ask? 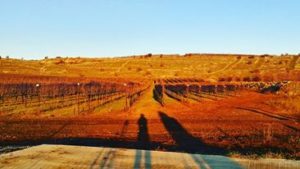 I was not in Europe, I was not in Napa… I was in Israel – in one of Israel’s top wine growing regions, the Golan Heights, bordering Lebanon and Syria. I would soon learn that all this beauty had a practical purpose. 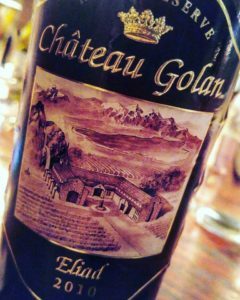 I was at Château Golan, a small winery making only 100,000 bottles a year. 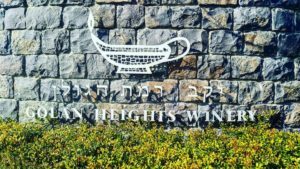 They own most of their vineyards, which encompass their winery, except for one Sauvignon Blanc plot that they purchase, in the Golan Heights as well, at a higher elevation of 2625 feet (800 meters), as compared to the winery and their estate vineyards being at 1312 feet (400 meters). The Chief Winemaker and partner, Uri Hetz was hosting our visit and fielding some tough questions, I might add. 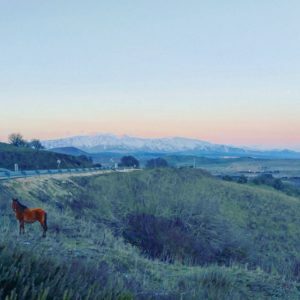 He was trying to explain his beliefs with regards to making wine, making sure we were not misunderstanding his words to be dogma against one type of process or technique or style… he was more interested in the intention of a producer – the intended practical purpose of a wine. Finally, after much back and forth, he talked about a quote that he saw on the wall of the Cooper Hewitt Smithsonian Design Museum in New York City many years ago as representing his belief. Before going any further, let me just preface this by saying that I cannot find this quote anywhere… so I will not try to make a guess as to who said it or what were the exact words of the original – I am quoting the words that Uri remembers… anyway, it is more important to express what the words meant to him than actually finding the exact wording. 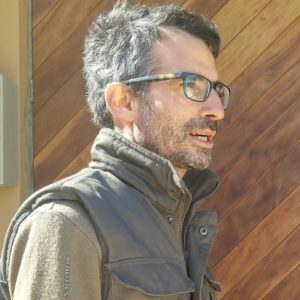 As he says, Uri does not want to make more money, he wants to make a better wine; he doesn’t want to make a beautiful wine, he wants to make one that is tasty and eventually it will become beautiful if he did his job right. I completely connect with his idea of beauty… as I feel beauty cannot be manufactured or forced, and the most beautiful people and things typically serve a practical purpose…whether they take care of others or simply bring them some joy, they always serve by bringing comfort and happiness to many of the beings in their lives. And the latter part of the quote rings true to me as well, as I think we, as a society, can mistakenly look too much to superficial factors as being beautiful and miss what truly makes someone or something shine – the intention. The next stop was the world renowned producer, Golan Heights Winery. If you have ever had any interest in wines from Israel, then you probably know them and recognize their premium Yarden series labels, with the oil lamp decorated with mosaic tile adorning them. They are the third largest winery in Israel, and as we were leaving Château Golan telling Uri that our next stop was Golan Heights, he immediately expressed his great respect for them as a real “professional winery”. 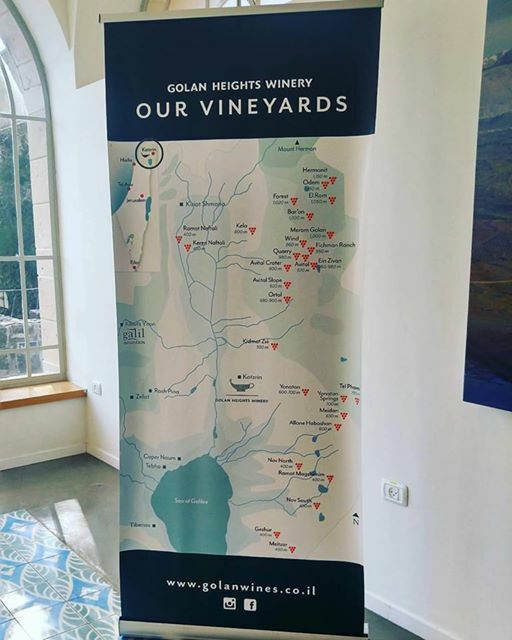 Upon approaching their thoughtfully landscaped visitor’s center, we were immediately greeted by smiling staff with maps of the Golan Heights wine growing area – I quickly realized that Uri’s words about them rang true. They were a great place for visitors from all over the world, there was actually a group from China there at the time, to experience the potential of the Israeli wine industry. 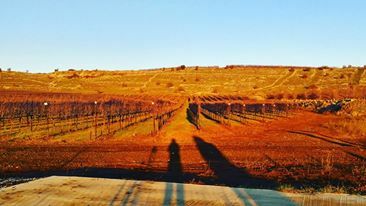 Golan Heights Winery served a practical purpose making a great first impression, on behalf of all of the Israeli producers, to many wine drinkers around the world, by the consistency of their wines, as well as how they greet those adventurous world travelers who have the Golan Heights on their bucket list. Golan Heights Winery’s commitment to raising the quality of Israeli wine actually goes deeper than what one can taste in their wines and experience at their facility. They were the first ones to come out talking about the leaf roll virus affecting many Israeli vineyards. They admitted that they themselves had vineyards that were afflicted and they took immediate action by grubbing them up, while calling out to other owners of vineyards to do the same in the name of raising the quality of wines in Israel. 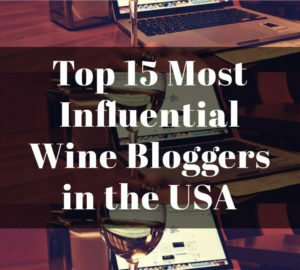 This is a rare act, as many wine regions around the world keep secrets, or in some cases were in denial, of issues that they were having with their vineyards. Our Golan Heights Winery experience was co-led by Australian Associate Winemaker Michael Avery, since legendary Chief Winemaker Victor Schoenfeld is said to be a little journalist-shy. But as Michael was taking us to one of their top single vineyards, Bar’on, I had to ask why a non-Jewish Australian would want to work in Israel. His answer was purely the idea of being able to work at the Golan Heights Winery. Their forward thinking, modern facility, coupled with their in-depth study and research involving all aspects of the vineyards and winery could potentially revolutionize the wine world, such as their partnership with French research authority, ENTAV, which is bringing high quality ‘clones’ (aka biotypes) of grape varieties to Israel that are handled in a way to guarantee they are virus free. Even if you take the path to be in the service of others, it does not mean that there is any assurance that others will understand your intention. For example, I knew a kind, sweet woman who would love to dress in neon colors because she loved how it brought smiles to so many people. Another person, who perhaps didn’t know that I knew this woman, made a snide remark about her trying to get attention and showing off. That person was obviously projecting how he/she saw the world, and didn’t consider the idea that bringing joy to others was this person’s intention… and so this kind hearted woman’s beautiful act of wearing something that brought smiles to others was lost on this other person. Sometimes our practical purpose is not realized by everyone, but it doesn’t mean the purpose is not served. We should not be afraid to give to the world because our gifts might be twisted, or questioned, by those who do not understand gifts without strings attached. Château Golan and Golan Heights Winery both make wines that reflect their beautiful intentions to those wine drinkers who are open to the experience. When we live a life with the intention to serve a practical purpose, we can never fail as there will always be someone who benefits from it, and benefiting others creates a beautiful world. –2016 Geshem Rosé: Grapes are grown specifically for rosé, 90% Grenache and 10% Syrah, very light pale onion skin color, short time on skins, fresh strawberries with spice. -2016 Sauvignon Blanc: (just bottled) Whole cluster pressed, divided in barrel and tanks. Flinty minerality, juicy peach on the palate, yet overall restrained and elegant with mouth watering acidity. 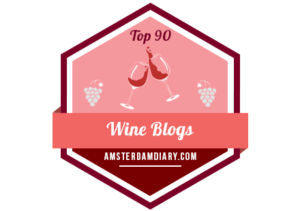 -2015 Syrah: (bottled a month & ½ prior to tasting) Smoke, spice, pepper, floral, red fruit, bright acidity and moderate, linear body with fine tannins. Gorgeous wine! Uri said 2015 turned out to be a much fresher vintage than people thought because it was a warm vintage. -2008 Syrah: Savory, rosemary and thyme, dusty earth with darker fruit and thicker texture. -2010 Eliad: Majority Cabernet Sauvignon. 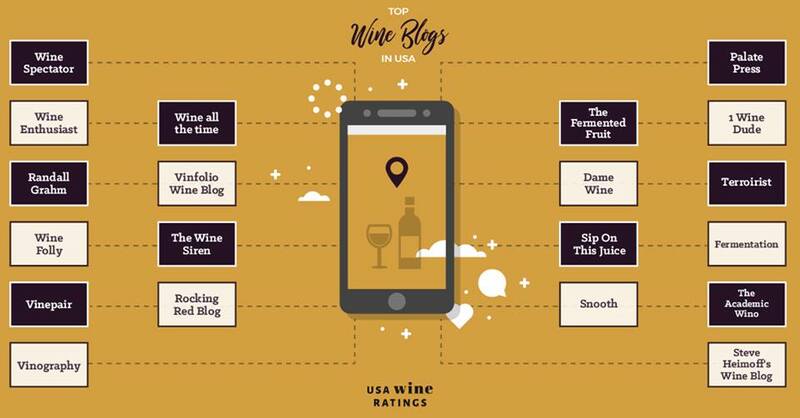 They pick one or two top parcels out of their eight of Cabernet Sauvignon and will sometimes blend Petit Verdot, Syrah, Merlot or Touriga Nacional, but not usually exceeding 10% of the blend. This 2010, remarkably, had a pretty, pristine raspberry note with well-knit tannins and an overall refined style. Why is it remarkable? 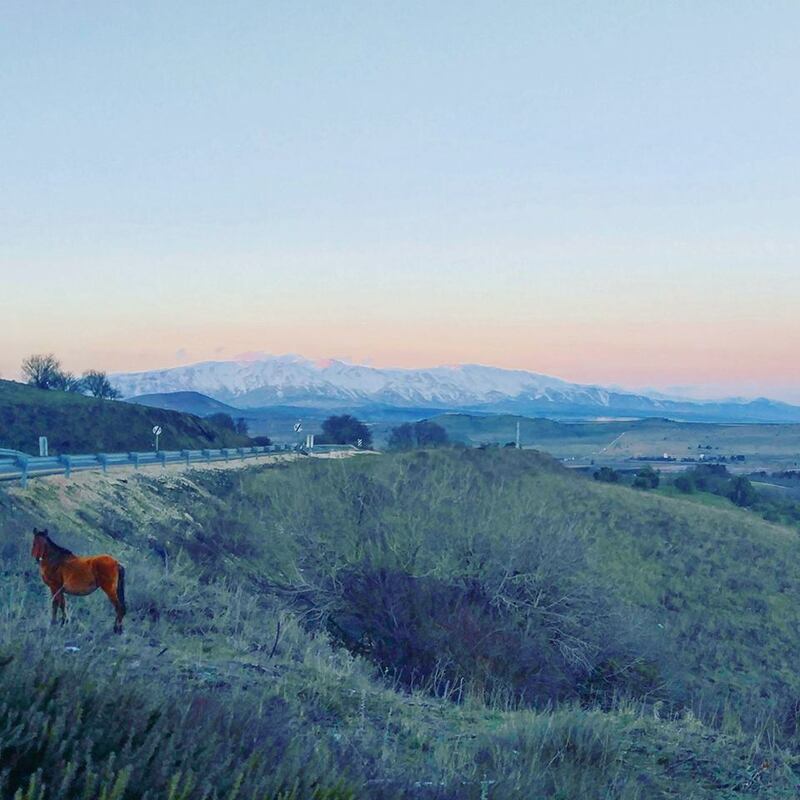 Because 2010 was one of the hottest vintages they have had in 15 years, and typically showed a lot of cooked fruit, but this one plot did not – that is what terroir does… and maybe the right practical intention had something to do with it too. Yarden series of wines: The premier label and flagship brand. 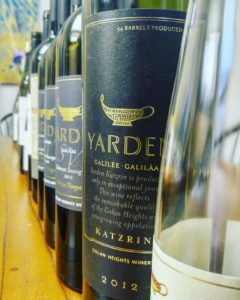 Each year, the finest grapes from the best vineyards are reserved for Yarden wines. Yarden is Hebrew for Jordan River, which separates the Golan Heights from the Galilee. -2009 Yarden Blanc de Blancs Sparkling Brut: 100% Chardonnay. Toasty notes with zingy green apple and lime blossom flavors. -2010 Yarden Rosé Sparkling Brut: 76% Chardonnay and 24% Pinot Noir. Pale salmon color with wild strawberries and a touch of brioche. -2016 Mount Hermon White: Blend of Muscat Canelli, Sauvignon Blanc and Viognier. Perfume and tropical fruit with a rich body. 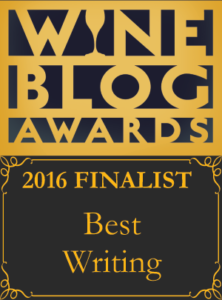 -2016 Yarden Sauvignon Blanc: Herbaceous with juicy peach and lively acidity. -2016 Yarden Pinot Gris: I was very impressed by this Pinot Gris since I was expecting not to like it, but I loved it. Thai spices, pear, and fleshy body with a long, refreshing finish just makes this a completely satisfying white wine. 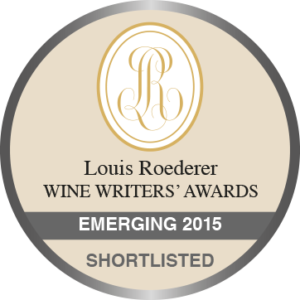 Interesting side note: 40% was placed in stainless steel, 40% in large barrels and 20% old barriques before bottling. -2015 Yarden Chardonnay: Sweet spice, vanilla and lemon confit with good backbone of acidity on this wine. -2014 Yarden Katzrin Chardonnay: A step up in complexity of flavors and texture with nutty aromas, baked apples and a full body with tannic structure supporting its weight. It was open at this stage but could continue to improve for four more years. -2015 Mount Hermon Indigo: Blend of Cabernet Sauvignon and Syrah. A well balanced, delicious, medium bodied red that can be found on the US market for only USD$15 – not bad at all! Also, the label was drawn by autistic children and a portion of the proceeds go to Alut, an Israeli Society for Autistic Children. -2013 Yarden Merlot: All the richness that one wants from Merlot, ripe black cherry and chocolate orange peel, yet good freshness gives life to these decadent flavors. -2013 Yarden 2T: 59% Touriga Nacional and 41% Tinta Cao. Exciting, wild wine with plum, leather and tar, with firm structure. -2013 Yarden Syrah: Cigar box and forest floor with brooding, dark fruit flavors that are lush yet lifted quality on the finish. -2013 Yarden Cabernet Sauvignon: Blackcurrant, sage and basaltic soil with big, manicured tannins that give muscle to the body of this wine. -2013 Yarden Rom: 50% Cabernet Sauvignon, 30% Syrah and 20% Merlot. Yarden Rom is a joint undertaking of Zelma Long, the internationally acclaimed winemaker, and Victor Schoenfeld, Head Winemaker of Golan Heights Winery. Intoxicatingly smoky note with tobacco leaf, black tea and a prodigious length of flavor that was delivered with refined expression. Only 54 barrels made. -2013 Yarden Bar’on Vineyard: 70% Cabernet Sauvignon, 19% Syrah and 11% Petit Verdot. The 2013 Yarden Bar’on Vineyard is the first-ever release of a single vineyard blended wine from this vineyard. Opaque color with fresh notes of mint, gravelly earth and graphite with majestic laced shaped structure. Only 20 barrels made. -2013 Yarden Cabernet Sauvignon Yonatan Vineyard: 100% Cabernet Sauvignon single vineyard. Vivid aromas of pine and anise bring a radiant trait to this luscious fruit driven Cab that had a superb length of flavor. Only 29 barrels made. -2013 Yarden Cabernet Sauvignon Bar’on Vineyard: 100% Cabernet Sauvignon from the single vineyard of Bar’on – blended wine previously tasted. Love the precision on this wine – lots of energy – and tons of structure with fine tannins – crushed rocks and wild flowers – pure and expressive with strong sense of place. Only 30 barrels made. -2012 Yarden Katzrin: 83% Cabernet Sauvignon, 10% Merlot, 5% Petit Verdot and 2% Malbec. 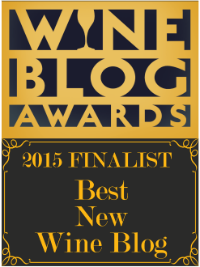 Yarden Katzrin wines are only made in remarkable vintages. Only 54 barrels made. 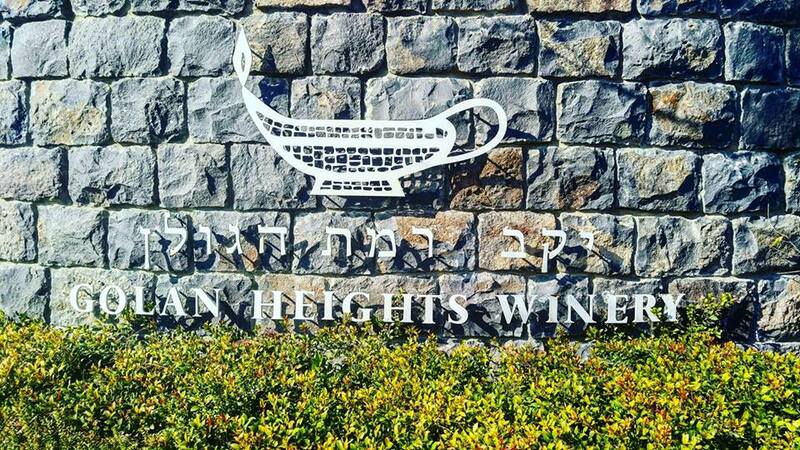 -2014 Yarden Heights Wine: A sweet wine made from 100% Gewürztraminer with around 240 g/l residual sugar, but you would never know it since the significantly cool temperatures in the Golan Heights has its trademark bright acidity evident in this wine. Rose bud and lychee syrup flavors made this a fun way to finish this tasting! 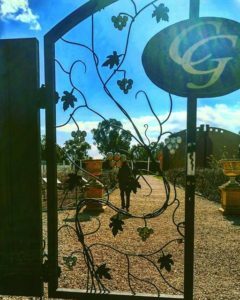 This entry was posted in Uncategorized and tagged Beauty, Château Golan, Golan Heights, Golan Heights Winery, Israel. Bookmark the permalink.